New PNAS paper: Experts surveyed on the probability of climate “tipping points” | Watts Up With That? A survey of climate scientists reveals uncertainty in their predictions of changes to the global climate, yet finds that they believe there is a real chance of passing a “tipping point” that could result in large socio-economic impacts in the next two centuries. The expert elicitation was conducted between October 2005 and April 2006 with a computer-based interactive questionnaire completed individually by participants. A total of 52 experts participated in the elicitation (see Table S2 in the PDF below for names and affiliations). The questionnaire included 7 events of crossing a tipping point. 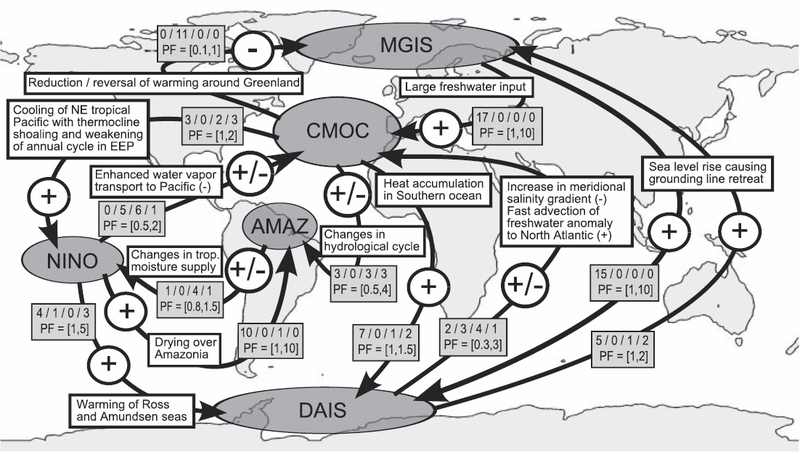 Elmar Kriegler and colleagues asked the climate experts to estimate the likelihood of impacts to components of the climate system under different warming scenarios. The five systems discussed in the paper concerned major changes in the North Atlantic Ocean circulation, the Greenland and Western Antarctic ice sheets, the Amazon rainforest, and El Niño. The probabilities given by the experts varied widely, but on average, they assigned significant chances to a tipping point in this or the next century for at least the medium to high warming scenarios. Using the experts’ more conservative estimates, the authors calculate a 1 in 6 chance that a tipping event will occur if the temperature increase in the next 200 years is between 2 and 4 degrees Celsius. For a higher temperature increase, the probability was just over 1 in 2. According to the authors, the results suggest that the large uncertainties that come with climate predictions do not imply low probability that catastrophic events will occur. Since the survey was conducted in 2005 and 2006, I wonder if the opinions are equivalent today. They might have gotten more bang for their buck if they’d used a survey company like Gallup. I’m sure the results would be faster. I have a slightly OT question here that I haven’t seen addressed, or, if I have, then my noggin hasn’t recorded it. What is the function of the internal temperature of the earth on earths temperature? I see discussion of earth as a black body, grey body, etc, etc, etc, but, nobody seems to want to think about the fact that the earth has a MOLTEN core, and an approximate constant soil temp of 56 degrees F or so. How much does this play into climate models and temperature. Thanks and hope this is O.K. to ask here. That picture is hilarious-seriously, Watts Up With That? I saw a great comic dealing with one potential problem using windmills as an alternative energy source here . I’m a fan of this comic but this is the first time that he’s done anything dealing with the global warming “crisis”. Thought the readers here would enjoy. I find myself wondering whether the dramatic rise over the years of the almighty ‘tipping point’ cliche will culminate in a runaway effect having recently reached its own tipping point of over-usage. I guess saying it is like wishing it. I was under the impression that for the last 6 million years or so of earth’s history there was a temperature limit of about 22 degrees C regardless of CO2 levels (up to 7000 ppm)? If in earths history we have has CO2 levels of up to 7000 ppm and a temperature of no more than 22 degrees C, how can there be a “tipping point”? This whole tipping point theory seems weak at best and at worst pure fantasy. Where is the scientific proof of a tipping point? Is there any historical parallel? This paper has got to be a new low point in climate science. Hopefully there is a bottom down there to stop science from sinking too low. Ohh, that’s really significant, isn’t it? What a joke. This is one of the worst examples of faux-science that I have read since the Summary for Policy-Makers of the IPCC report. Exactly how was this 1 in 6 chance “calculated”? Lets say I follow college basketball (I don’t, really) and am asked by a freind what I think the odds are that Kansas repeats in this year’s tournament. I say 60%. How is this procedure mathematical, and how is it scientific? It isn’t. Expressing an opinion as to the likelihood of a future event is nothing more than a subjective expression of one’s own confidence in that outcome. There is no calculation, there is no science. It carries no weight whatsoever unless accompanied by some historical track record of the predictor of making previous predictions later proven to be accurate. I would have loved for someone to include in this questionaire a request that the participants identify all previous examples in which they predicted a climate “tipping event” associated with a given range of temperature increase, and whether the predicted “tipping event” was or was not independently found to have subsequently occurred. It is to laugh. Hahaha. I thought this was going to be an article on the dangers of cow tipping which would have required infinitely more science than this pnas paper. So… so… so … I’m rather lost for words. Is this some kind of subtle satire or Al Gore’s game plan to take over the world? It appears CMOC is the quarter-back; that must be Al Gore. MGIS is the transatlantic Jim Hansen and, of course, the antipodean DAIS must be Aussie Tim Flannery, the flim-flam man, who could never resist getting up onto a dais. I suspect NINO is the Canadian fruit-fly guy, David Suzuki, as it appears to emanate from that country. They forgot one major tipping point. How much of a drop in global temperature must occur before the AGW proponents become general objects of derision? Within 50 years we will have all kinds of new technologies which will remove fears about CO2, and give people who like to worry something completely different to worry about. Tipping point? Might be nice if someone defined the term. Maybe we should ask Al’s wifey. Back to basics: what is a “tipping point”? OK, assassinating the Archduke Ferdinand is one. Anyone else see a “tipping point” trend here??? ……………. she’d be your whunkle. What are the chances of rain tomorrow? That’s a Joke; when I landed on the Docks of New York’s Manhattan Island almost exactly 48 years ago to the day; all my worldy goods were in two wooden crates sitting there on the dock (one was actually full of nothing by LP records) We were inside a Customs enclosure (fence), having done Immigration three days earler in Port Everglades Fla.
After being cleared by Customs, a NY dock hand, who spoke no English at all, towed my two boxes, which were already on a dolly, exactly six feet from the inside of the fence, through a gate to the outside of the fence; where a shipping agent took possession of them with my instructions to ship them to Beaverton Oregon. The NY dockhand, of apparent Eastern European ancestry, was being hassled my some immigration officers, who imagined he was ship’s crew (Dutch Boat) jumping ship and trying to slip into USA, so they were wanting to see HIS papers (but not mine). Eventually his foreman bailed him out of the mixup; and then he held out his hand for a tip for his six feet of cart trundling, which I could have done myself. We were standing right underneath Anthony’s sign which read “NO TIPPING”. If I had jumped upwards, I would have banged my head on it. The same sign was on every overhead beam the whole length of the docks. So I deposited a nice shiny US Quarter in his palm, which was a significant portion of the total $40 US (and all other currencies) that we had on our persons. Where I came from offering someone a tip was considered an insult; as if he wouldn’t do a good job unless you bribed him with money. The guy pushed the quarter back at me and mumbled “there’s no tip” or something muffled that sounded like that. So I dutifully put the quarter back in my pocket. The guy exploded; “c’mon ! arf a buck !”. it appears he said “That’s no tip”. So I pointed to the overhead sign and told him in four letter words to take a long jump off a short pier. I still hate tipping people; it’s a scam. But as to the earth’s climate having tipping points; given that the orbital parameters stay pretty much what they now are. No system that is as stable as the earth’s climate is, could possibly have tipping points, or it would have tipped a long time ago. So forget climate tipping points; that’s also a scam; just like tipping is. Just seems reasonable that there is only so much solar energy to put into the system. If the icecaps melt (which they have historically), and CO2 rises to 1200ppm (which it has historically), the temperatures could probably get no higher than the historical maximum. “They” say that’s around 22C (give or take) — unevenly distributed with the coldest areas warming most. Yes, in a “catastrophe”, in maybe a hundred years, some coastlines would move substantially inland (particularly in Florida). People would adjust as things progressed over the decades. Some major cities would be rebuilt inland (seem to rebuild them anyhow every hundred years or so — jobs and progress). More farming area would be created. More living area would be created. Globally, no big deal — maybe even a good thing — even if things do “tip”. Anyhow, the burden of proof lies with those who actually say these things will happen and can only be “bad for us”. The earth’s core temperature is somewhat unknown with estimates between about 5,000 and 10,000 K. Apparently ongoing radioactive decay continues to keep it warm. I don’t know if there are also tidal forces that also keep it warmed due to the friction internally as the sun’s gravity pulls bulges on the earth crust. It is thought that the icy crust of Europa hides a liquid ocean underneath that is maintained by tidal forces energy since Europa is so close to Jupiter (maybe it’s Saturn; I can’t remember everything). So earth should have a continuous outflow of thermal energy from the core; through the surface, but I have never seen any calculation or figure for what that flux might be. But it is known from mining operations that the temperature increases by so much for every so many meters underground depth; presumably after some surface skin which is warmest on the outside. So that would seem to set a maqximum depth for penetration of energy from solar heating going into the earth’s surface. I have no idea what that depth is. In the oceans, sunlight propagates many tens of metres into the deep oceans, and it gets colder as you go down, at least to some thermocline, and then apparently it continues to get colder with depth; but much slower, till it gets down to about +3 deg C.
Salt water has no temperature of maximum density before it freezes, like fresh water has at +4 deg C, so salt water always has a positive temperature coefficient of expansion; so deep water warmed by penetrating solar energy, expands and rises where it picks up even more solar energy and warms even more; so it continues to rise till it gets to the surface. At the surface it is hottest of all, si it radiates to the atmosphere, and it conducts to the atmosphere, and the warmed atmosphere also rises; and it evaporates into the atmosphere, which takes astronomical amounts of latent heat around 545 cal per gram into the atmosphere. So convection trumps conduction; and I don’t think there is any such thing as a pipeline feeding solar energy into the ocean depths; ther’s no physical mechanism to do that. Not surprisingly those new diving buoys can’t find any such pipeline either. This survey was done in 2005-2006 and is probably is irrelevant today. Some of the participants will have hardened in their views, and others will have changed their minds. Either way the scores will have changed. Good. We can dispense with such mundane details as facts, reality, and the like. Just conduct a poll and we shall know the truth in all its glory. And then — voila — we have a consensus. The problem with this paper is obvious. The selection of experts was arbitrary. It should have been based on a poll to determine which experts were most expert on determining tipping points. Let’s conduct a poll to see if this paper needs further review. Did they come up with a date when this tipping point will occur? The concept of “tipping point” seems to imply to me that our climate would shift from its current attractor to some new one. I haven’t been able to find what people think the new attractor would look like. Some have said Venus, but we’re missing quite a bit of CO2 for that one. If it’s not possible to construct a model of such an attractor, then maybe it’s because it isn’t there. If there’s no new attractor to tip to, then there won’t be any “tipping point”. But it is known from mining operations that the temperature increases by so much for every so many meters underground depth; presumably after some surface skin which is warmest on the outside. I’ve read similar statements. I understood that air pressure was partly involved in the warming. The deeper you go, the greater pressure there is. Of course, the pressure hypothesis is also reasonable to keep core temps up. Solar energy has (based on its time domain) no more than a few feet of influence on soil temps (its a common first year heat transfer problem of an infinite medium and mixed radiation convection boundary condition). As for the calcs of flux, Lord Kelvin was the first to use the measured heat flux from the earth to calculate its age – and in doing so screwed up geological sciences for almost 50 years. He did conclusively prove the earth was much older than 6000 years – more in the 20 to 100 million year range – but this didn’t correlate with fossil records, which indicated a much longer time frame. It took the discovery of nuclear fusion to bring the two time calcs into sync…. I read a book some time ago (and I apologize for not remembering the title … I read a lot of books) that basically reviewed studies that showed that expert opinion was no better than non-expert opinion (had no better prediction skill) when it came to complex areas with high degrees of uncertainties. I think this jives strong what most of us have probably experienced at some time or another. The media is full of ‘experts’ who may be very good at prediction of small perturbations from everyday events within their field (linear causality basically), but whose prediction is no better than non-experts once choas/complexity enters the picture (i.e. think of the current financial crisis and all those ‘experts’ with egg on their face). George E. Smith (15:49:40) : I still hate tipping people; it’s a scam. Ah, the joy of tip-free New Zealand comes to mind! Loved the place. Wish I could live there. Like Oregon, but the size of California, with wonderful people. Though when I checked into the hotel and was handed my key with a single word question: “Milk?” I was just a little unsure… Seems I was being asked if I wanted a cup sized milk carton to make my tea civilized… Once I figured out what was meant, I took the milk… Then I was asked if I wanted to be :”knocked up in the morning?”… another long pause as we sorted out that that meant a ‘wake up call’ and had nothing to do with, er, reproduction. First night asked a waiter about the tipping thing and was it real, he assured me with great pleasure that Kiwi’s Did Not Need Bribes to do a good job. I’m not particularly worried. Look at the ice advance rate during a glacial and it works out to about 800 feet average laterally per year. You could out walk a year’s advance in one tea break… but the idea that we might push through what is repeatedly shown to be a hard ceiling to the warm side is, er, “odd thinking” IMHO… Once the light switch is clicked up, it can only click down, though it may take a while and an outside force to do it. Is there any other term for ‘feedback loop leading to limit cases at each end with both ends stable” other than hysteresis? I find explaining it to non-tech folks tiring. (Though the light switch example usually works). Somehow we need to teach the AGWers that “feedback” has many flavors and only a few lead to runaway processes. I.e. growth is “S” shaped not exponential. I think the most obvious objection (blatantly obvious) to this idea of ‘tipping’ point is that if there is a tipping point it MUST have occurred in the past. There is nothing unique about our current situation compared to the entire history of the planet. So where is this tipping point in the data? I see several tipping points, but they are all into and out of ice-ages!! No where in the data has there been 3-levels i.e. ice age to interglacial to runaway global warming desert earth. If this climate state didn’t exist in the past, it doesn’t exist as a viable state. There is a tipping point alright, but not in the direction AGW believers think it is. I noticed how all the previous temp spikes happened shortly after a spike in the SST data, there was such a spike less than a few months ago and global temps. may have responded to that, it’s going down again so it should drag temps. down with it. I selected a year or two before 1998 to see how SST’s helped make that year so hot, you could say SST data is like a window into the near future for temps, and has much more effect than the sun at the moment. Well, should submit this, here goes nothing. In it you can see the ice advance…. The fabulous tipping point, Hansen’s deus ex machina that will rescue his climate apocalypse theory just when it seems that nature does not want to cooperate. Do any of these so called experts have the wisdom and humility to admit that they just do not know the answer? Bottom line: this source of heat is miniscule and can be disregarded as far as Earth’s temperature is concerned. On the other hand, the Sun . . .
That’s really interesting. I wonder if the satellite data can be broken out between land and sea temps. 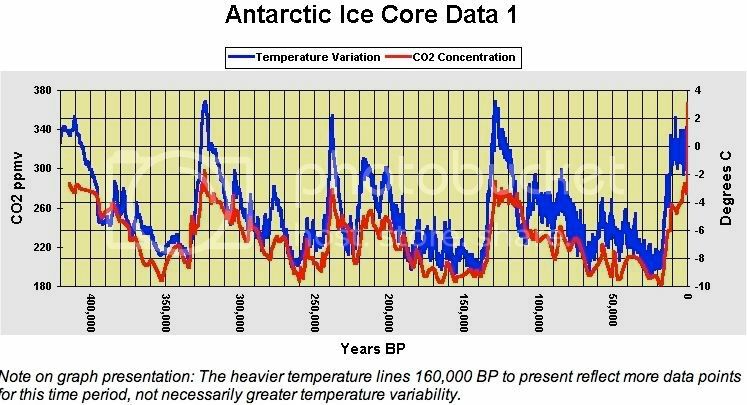 Ice core data showing that CO2 has no discernable effect on temps: click. The rise in CO2 is the effect of global warming, not the cause. This is a cool way of doing science! Soon, Gallup will be determining ALL the important science questions! Hey, we might finally get a grand unified theory! A T.O.E !!!! By polling consensus! I’m so excited about the future of science! One acre is just over 4,000 square meters. That means geothermal heat is about .03 watts/meter. Not a lot. But it heats at a constant pace, 24 hours a day, more than doubling its apparent effect when compared with solar insolence. And unlike sunlight, it heats equally at the equator and at the poles. The only tipping point I care about is the one that delivers the fine wine from my glass to my taste buds. They appear to have neither the wisdom nor the humility. However, there is still time left for them to redeem themselves. Also from the above epw link I particulary like the following. UN IPCC Scientist Dr. Steven M. Japar, a PhD atmospheric chemist who was part of Intergovernmental Panel on Climate Change’s (IPCC) Second (1995) and Third (2001) Assessment Reports, and has authored 83 peer-reviewed publications and in the areas of climate change, atmospheric chemistry, air pollutions and vehicle emissions, challenged the IPCC’s climate claims. “Temperature measurements show that the [climate model-predicted mid-troposphere] hot zone is non-existent. This is more than sufficient to invalidate global climate models and projections made with them!” Japar told the minority staff on the Environment and Public Works Committee on January 7, 2009. E.M Smith — I agree with you completely. There is an obvious limit. Rather than hysteresis (which seems a good enough word also) I think of it as ‘clipping’. At the top end we are reaching saturation. 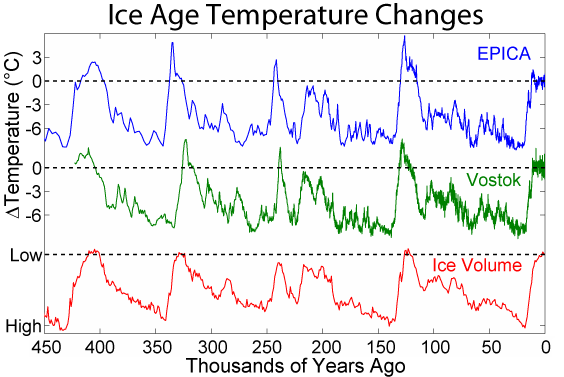 The first time I saw a graph of the temperature going into and out of ice ages that is what immediately struck me — it ends at approximately the same level every time — that can’t be just a coincidence. What would explain this? Saturation. (see http://www.ianschumacher.com/maximum_temperature.html for an incomplete explanation). I think I read that someone at the ICCC had a similar explanation (but probably more accurate and scientific) based on conservation of energy. It also seems fairly obvious to me that the current thinking on runaway greenhouse effect on Venus must be wrong. As is mentioned in another topic on this thread, what about latent heat, what about internally generated heat? That has to be the explanation for the high temperature on Venus … there is no way that the greenhouse effect could create temperatures higher than that of a blackbody … it is not possible. Robert Austin “The fabulous tipping point, Hansen’s deus ex machina”. What a fabulously clever statement! Mind if I borrow it sometime? 🙂 Yes it totally is his deus ex machina, LOL … totally. Goracle! Or run the Mr. Peabody climate model…Sherman! …… set the way-back-machine to the future! Me, I’m sticking with my calibrated Ouija board! I LOVE IT! thanks for posting that. “science by polls” courtesy of PNAS: – How many in favor? – How many against? Carried! Next issue? Since already the democratic process is highly perverted and as a result the level of political discourse tends asymptotically toward zero, we can expect the same with science: after all why should the garbage cleaner’s opinion be good enough for electing the leader of the free world and not be taken in account when reviewing science. It is the logical stage. If Leif sees you are referring to the sun’s insolence he’ll probably bust a gut laughing. You’re right, it’s insolation. There was a disconnect between the keyboard and the screen pixels. I blame global warming. Pofarmer – you said the underground temperature near the surface is constant. So to the atmosphere it’s probably treated as just another constant. It is also obvious on a hot beach, particularly one which was snow-covered a few months earlier. that surface temperature is significantly affected by weather. Of course, it probably should have been studied – and maybe has been. Good hunting. And it’s on the basis of THIS that we’re supposed to destroy the global economy, while the primary prophet of doom is tooling around in his gigantic gasoline-powered houseboat (if he isn’t relaxing in his enormous mansion). I don’t know whether to puke or go blind. Kiaora Bro! It is a truely wonderful country to live in, fantastic people, lived there for 9 years. And yes, we Kiwi’s do have some odd sayings, some even sound strange to a Pome like me. As we in Sydney, Australia, enter autum, I wonder how cold winter will be this year. It was pretty cold last year as we recorded many lows several degress below “normal” or “average”, depends on what TV news program you watch. But I always laugh when they compare an absolute daily figure with an average. No, AMAZ is the most important component. Since it has no outward transfer process anything that enters AMAZ stays there. Ultimately, everything will accumulate there. I’ve got no idea what it is, I hope it’s safe. When there is a geothermal event such as a volcano, then it is taken into account when modeling climate reactions. However as the internal heat of the planet is notionally constant then it is not. That’s not to say it’s effect is the same for all points on the earth, but rather they don’t alter much. Unless a new rift opened that upset the homogenized nature of the geothermal balance then at least I think it is reasonable to ignore it. What? You believe that human CO2 emissions are causing the planet to warm up? Larry the Cable Guy does Git Er Done! Ron White just does everything funny…all he has to do is talk…. On geothermal energy: Did you know that there exist applications for heating and cooling houses with it? So this .93 WATS per acre are just what comes out of the insulating top layer. In the ocean bottoms, at which level in the ground the temperatures are 50C, convection is taking away much more energy than estimated up to now. Of course it will be constant unless there is volcanic activity. Ever since the ice core data forced me to look in the face the true prophecy: “an ice age is coming in a century next to you”, I have been thinking of how to stop it. So had Hansen. There is a link somewhere in this blog where it shows he said that we can prevent the next ice age by emitting excess greenhouse gases. Well this ability goes down the drain, because the rising CO2 has not managed to stop the cooling PDO . I have been thinking of aluminizing the moon: i.e. cover the face facing us with aluminum foil 🙂 ( a rocket bursting with confetti of aluminum would do it), but am ten years away from real mathematical skills and too lazy to brush them up to see whether there would be enough extra wattage to do the trick. This leaves me completely puzzled as to how geothermal heating systems can work. If heat transfer through the ground is that low, one would think that ground loop systems would gradually cool the ambient soil and cease to work. But this doesn’t happen…. Since as far as the sun goes, the earth and moon are in the same ballpark, if all the sun energy falling on the moon at full moon came to earth, that would give 5% extra energy ( radius of moon 1/8 of earth, area of face pi*r**2). Thats a lot of watts per meter square. average would be half of that. E.M.Smith (17:34:50) :Is there any other term for ‘feedback loop leading to limit cases at each end with both ends stable” other than hysteresis? I find explaining it to non-tech folks tiring. In electronics you have circuits that show hysteresis and “latch up” to the high supply voltage or ground potential, which would be a rough analog to the square wave oscillator that our climate appears to be, flopping from the low limit (ice age) to the high limit (warming peak). For the sake of discussion you might try explaining it like a logistic curve that approaches a limit. For example the percentage of a population that are infected with a disease. At the starting point you have no one infected (ice age), then a single person gets a communicable disease. He spreads it at some rate into the uninfected population, which starts an exponential growth cycle. This is where the tipping point and the simple limited logistic curve differ. The tipping point concept assumes an irreversible over shoot like a mass death event, that wipes out the population. If on the other hand, the curve is limited by some natural means like a low mortality infectious disease is, at some point the infection rate drops as you reach a point where almost everyone who can be infected is infected. At that point the new infection rate drops toward zero, and the total number of infected people reaches a maximum plateau at some value dependent on how many people are naturally immune to the disease, or due to living habits are not likely to contact an infected person and contract the disease. That sort of logistic curve approaches an upper limit and then the total number of infected persons drops back to zero according to the natural recovery rate of the population. The trick is figuring out what is the mechanism that establishes the apparent upper and lower limits to the climate and global temperature. The natural historical cycle implies that some effect stops the cooling at some minimum temperature (maximum ice cover), and some effect limits maximum temperature when some mechanism of cooling begins to dominate heat input. To use a very crude analogy. You hold your home at some temperature that you find comfortable with a thermostat. When you have a party, as new guests arrive the heat load in the house increases by about 300 watts for each additional warm body that shows up at the house. The temperature in the rooms rises slowly until some one notices it is hot and stuffy, and people start opening windows or leaving doors open or moving out on the patio where it is more comfortable. The human comfort zone establishes a natural upper limit to the temperature the crowd of people will tolerate. We know that at sea surface temperatures near 84 deg F (29 deg C), some basic weather processes change. For example the Indian Monsoon turns on when SST get near that upper limit, and rainfall during the monsoon tracks well with SST temperatures during the period just prior to the Monsoon season. Cyclones also become stronger and larger (with larger cloud shields) as sea surface temperatures increase. That “trigger temperature” for strong convective storms is not far from that long term global average upper limit of 22 deg C. Local humidity conditions also play into this over land, where humidities may not be high enough for strong convection to develop due to instability, as warm moist air is unlikely to be lifted above its condensation level to trigger thunder storm development in low humidity conditions. In the oceans available humidity is not likely to ever be an issue at these temps. That I think, would be a reasonable explanation of that observed “implied” upper limit. When large areas of the ocean reach these critical SST numbers the heat transported to high altitudes by convection and the dramatic albedo changes produced by these large convective storms over whelms stored heat in the ocean and solar heating and cools every thing down. I see thunder storm development like a pressure safety valve. As temperatures and humidities rise, thunderstorms move enormous amounts of energy to high altitudes in very short time periods, and also cut off radiant heating by the sun to the lower atmosphere and ground while they are active. Once that excess heat is radiated to space falling rain and hail rapidly cool down the ground and lower atmosphere to temperatures below that critical temperature humidity combination that is inherently unstable (high CAPE “convective available potential energy”). When CAPE is high it takes very small triggers to kick of massive thunderstorm developments. At low CAPE numbers it is almost impossible to trigger a thunderstorm even at high temperatures. Here in the high plains temperatures over about 84 deg F and humidities over 50% RH almost guarantee an active thunderstorm day. The only thing left is to figure out a counter balancing effect that would put a low limit on the earths surface temperatures. For example as the earth cools at some point, no place on the earth would be warm enough and moist enough to trigger convective storm development. That would completely shut off that “heat pump” that pushes warm moist air to high altitudes and creates large areas of very white clouds during the summer peak heating. Then you have dry cold conditions and stable weather during the local summer where the oceans slowly store up heat until that water vapor heat pump begins to turn on again. Once temperatures and humidities get high enough, in the summer months as warm moist air moves over the ice fields, it would lots of warm rain on the coastal ice fields and snow cover. Rainfall on snow can lead to very rapid melting of snow, which changes albedo as more and more land is melting off each summer the ice cover slowly melts back and the climate warms back up until it switches into a rapid warming mode (interglacial). If this cycle works as I imagine it, I would expect at the end of the interglacial cycle you would see much higher precipitation (pumping massive amounts of heat to high altitudes), and higher snow depths during the early fall, late spring that would shift the earths albedo toward a higher heat loss due to higher reflection (snow blitz concept). This in turn would cause less time for the snow fields to melt off in the spring and summer, so less total heating due to the higher albedo. If the climate hovers at a central point in that oscillation very small changes in TSI could make it “flop” to either warming or cooling trend, until these limits kick in stopping it and conditions gradually creep back toward that median value. Throw in the additional effect of seasonal heating cycles the Milankovitch cycles,and volcanic dust inputs, and they could move that whole upper limit lower limit higher and lower. Suppose the lower limit during an interglacial cycle was about what we saw during the little ice age, and the upper limit is that 22 deg C limit implied by historical records during warm cycles? To drop back to the infectious disease analogy, suppose that you substitute convective storms for infected people. If during the summer you have lots of convective storms covering most of the warm ocean with high cloud layers you effectively “cut off heating” in the afternoon every day when the storms build. When you get to the point that all the warm ocean water is covered by storm clouds every afternoon, you have created that upper limit barrier. The oceans cannot heat up any more because they are screened from the sun during the afternoon heating period, and heat losses to space go through the roof while the storms are active pumping warm moist air to 50-65k ft altitudes. When the storms collapse in the evening, the sky clears and night time radiant cooling is easy in the now clear skies. This is the pattern we see during the summer thunderstorm season as the thunderstorms build during the peak of the heating day, grow vigorously until shortly after sunset then the skies clear into the night. Each part of the country has a natural time of the day when this process kicks off. Farther east the peak time for thunderstorm development is later in the evening and would have less impact on day time heating but would still pump large amounts of heat energy to high altitudes. It seems to be a logical cycle to me, but I do not have the information to verify or falsify the concept. This is sort of an off the top of my head post so I hope that makes sense as a possible pair of boundary conditions that naturally limit climate shifts to a relatively narrow band depending on the prevailing heat input due to TSI and its modifiers like volcanic ash and planetary motions. I’m confidently predicting that we will be able to say that the tipping point was reached when older white guys became the world’s radical dissenting activists against big government. OT: Mount Redoubt in Alaska alert level raised to orange. Whilst this might be filed under ‘consumer research’, I am stretched to understand how this is ‘science’. 1. ‘Expert opinion’ is an unsuitably vague term. If those experts carry out research on one of those ‘tipping points’ and their funding is dependent on keeping that danger alive, then the chances of them voting in more than one way is flat zero. 2. What evidence do the experts provide for their assertions? 3. What is the scientific hypothesis being proposed other than ‘A bunch of Govt funded scientists have proven that turkeys don’t vote for Christmas’? 4. What sanctions will be imposed on these ‘experts’ if their unsubstantiated and highly co-ordinated scaremongering turns out to be wrong? 5. Is PNAS now to be ranked with Science and Nature as a new political channel of campaigning? New peer-reviewed study: In summary, there is no atmospheric greenhouse effect, in particular CO2-greenhouse effect, in theoretical physics and engineering thermodynamics. Thus it is illegitimate to deduce predictions which provide a consulting solution for economics and intergovernmental policy. That sucking sound you hear is all of the air and energy being sucked out of Al Gore’s global warming climate change climate crisis machine. I think there is the danger of falling into the same mindset as the warmista here. Didn’t I read somewhere that a single hurricane develops as much power as the entire U.S. annual consumption of energy? Or something along those lines. One of the main arguments against AGW is the puny nature of our influence on natural systems as vast as the climate. If we entertain ideas of being able to tweak the thermostat, it gives creedence to a false notion of potential human influence. I anticipate that once carbon tax is in place, it will be defended no matter if that involves a volte face whereby it is suddenly ‘discovered’ that co2 causes cooling rather than warming if the climate heads downwards in temperature. The physics is already on hand. Has anybody noticed (because I have… for the PAST TWO YEARS, every day). This picture has not changed nearly for every day! CMOC hikes to MGIS while NINO hooks to the sideline and DAIS runs a post. MGIS can hit DAIS long if he’s open, but otherwise can throw to NINO who laterals to AMAZ coming out of the backfield. This is exactly the play the Cardinals ran in the Super Bowl and look where that got them. A large meteor or volcanic eruption could cause a TEMPORARY tipping. These events have happened before, yet the earth recovered every time. The earth just doesn’t tip that easily. Show me an event where it has tipped. A gradual warming will not tip the climate. Tipping is a scare fantasy. I don’t believe in irreversible tipping points. The earth has always recovered. Speaking of tipping, looks like we may be tipping into yet another La Nina. There’s some awfully cold water pooling out there. In New Zealand we obtain a small but growing part of our electrical energy from geothermal steam and are currently adding further power stations, mainly in the Volcanic Plateau of the central North Island. Many homes and hotels in Rotorua use the steam directly for home heating and many motels offer private thermal spas along with the room. In Rotorua, they had to slow down the use because the famous geysers at Whakarewarewa were being depleted as pressure reduced. Kia ora Pat and EM Smith. Taxi drivers still don’t accept (and some even decline) tips. Some round the fare downwards to the nearest dollar. Sadly, some bars now have jars with cute little signs like ‘Good tippers make better lovers’. Bar staff put in a few coins to encourage the rest of us, but it’s not catching on. It’s an Auckland thing, I think. Mostly, we are still gloriously tipping free. plant physiological responses to changing atmospheric nutrients). In other words, as Rummy said, we don’t know what we don’t know. “The concept of probabilities for social and economic systems and developments assumes a very different role to that in natural sciences. Even if probability distributions can be constructed, they are inherently subjective and also time dependent. to existing scenarios (example: IS92a) creates the danger of artificially constructing “expert consensus”. This was in 1999 and in public statements the science was already certain and settled. In fact Professor Bob Watson when Chairman of IPCC in 1996 was asked about scientists who disagreed with IPCC he said “The science is settled and we are not going to re-open the debate now.” He is currently the UK’s Director of Strategy at Tyndall and Chief Scientific Adviser to DEFRA. That is a very good paper by Christopher Monkton. Refreshingly clear and apparently free of dogma. Why are views such as this not getting the airspace they deserve in this lopsided debate? Don’t say he works for Exxon? While I like your article on “tipping points”, I must point out to you that your picture is completely in accurate. While most here are thinking of “tipping” as in “give a tip to your waitress”, this sign has nothing to do with that. The EPA law is about “fly-tipping” which was indeed enacted in 1990, and is illegal for a very good reason. The picture of your sign pertains to the dumping of trash and NOT tipping your waitress! Additionally, the EPA Act 1990. You really should change the caption on that picture, it gives a very false impression. It’s meant to be humour. Everyone in this forum knows this is not about tipping waitresses, or cab drivers. If we did, we would all be rooting for Hansen, Gore and the rest of the global warming madness. I scanned over the EPA document. Another glittering masterpiece of Soviet-like bureaucracy. scanning the comments I guess there are a couple of narrowly-horizoned dimbulbs here who were mislead. In fact there are hundreds of tipping points available and all of them make more sense than the 52 experts in the original survey. Over to you for the most hilarious. I have serious problem with all theses climate experts who constantly preach only doom and gloom for mankind and the climate of this planet. They seem to be unable to get right neither the first few years nor the first decade in predicting realistic actual global temperatures. Now we are being asked to accept climate forecasts 100 years, 200 years and even a 1000 year ahead and some with even 90% confidence. It seems to me that climate science is the only free money science going around town today and if you want some of the action you have invent a potential threat whether real or imaginary, exaggerate it and then sell it to get the your share of the free money. We just heard from 2009 International Conference on Climate Change attended by some 800 scientists and there was no such tipping point message coming from this conference. Matter of fact it was the opposite message .Natural variability is what drives our climate. We have no control over this. There are just too many so called experts who now totally confuse the public. Thank goodness that the public is not buying this as 44% of them now believe that long term planetary trends are responsible for the climate change. The governments remain gullible and give our hard earned tax money away too easily while people are forced to live in tents with no jobs and no money others are chasing nebulous and expensive climate studies 1000 years ahead. What waste. We need to deal with our today’s problems first. Let’s focus on legitimate goals like cleaning up real air pollution like SO2, NOx, CO, particulate matter, ground level ozone and smog, volatile organic compounds, lead. Let’s improve our energy efficiency and develop cleaner fuels but let’s stop focusing on CO2 only. It will do very little to change climate.Instead of preparing for unprecedented global warming for the next 30 years we better prepare for global cooling and quickly for the cooling has already started.
. . . To use a very crude analogy. You hold your home at some temperature that you find comfortable with a thermostat. When you have a party, as new guests arrive the heat load in the house increases by about 300 watts for each additional warm body that shows up at the house. The temperature in the rooms rises slowly until some one notices it is hot and stuffy, and people start opening windows or leaving doors open or moving out on the patio where it is more comfortable. The human comfort zone establishes a natural upper limit to the temperature the crowd of people will tolerate. . .
A waggish friend used to argue that warm temperatures were caused by increasing numbers of people. Witness the equatorial lattitudes, where the population far exceeds that of colder climes. Or, as Hotrod points out, look what happens when people gather in a room—it heats up so much that people take their coats off! My guess is the odds are 50/50. It either happens or it don’t. OT, this just in, hot off the teletype, whatever, but Gentleman James is at it again. Here’s one tipping point worthy of note, that of of Climate Realism. This is truly something for the Alarmists to be alarmed about. Cosmic rays at near record-high levels (is this a fact?). We are reaching a tipping point, though. Ever since the education establishment began demolishing the safety net of moral teaching (beginning around the 1920’s, with the ejection of teaching the Constitution from schools), we have engineered a generation which is almost, but not entirely devoid of the concepts of self-rule and capitalism. Thus our “march to socialism”, which stems from the fact that so many feel that “soaking the rich” will improve the lot of the underclass, somehow. (See: This faux outrage against the AIG execs who got bonuses, and now Congress wants to pass ex post facto tax law to target this supposed inequity.) This AGW scare is a part of the attempt by some to aggrandize power over all of us by making the underclass dependent upon them to provide for all our needs and wants. This may seem off-topic to many, but it is the topic. The AGW gang are a part of this attempt to get control of commerce through carbon-taxation (ergo, Cap and Trade ). Beware, these people will gain that control, and things will become increasingly expensive. Staple foods will become more rare and costly, and there will be strife and trouble. All because so many feel sure that these “experts” must know what they’re talking about. That is the purpose of presenting consensus in lieu of science. All of this predicting and calculating and scaring is based on the silly assumption that we can even measure the Earth’s “average” temperature and that this “average” has a meaning. It does however give us something to do all day. Amazing accomplishment, raising the appeal to authority to a science while establishing the notion of a local consensus as scientific fact . . . Gore’s method on a nuclear scale. This will make science a whole lot easier. My gawd! I never correlated the phrase “tipping point” with more funding! What a calculated and cleaver use of words. This goes back to the conflagration of like-minded green scientists who wished to somehow bring about a green utopia and freedom from foreign oil. With benevolent thoughts they conjured up meaningless…um..er…meaningful, emotional phrases that would not only cause bucket tipping but would bring the group to popular fame and increased publication. Which would then lead to new more leisurely pursuits in scientific inquiry: polls! In an article in Scientific American (March ’05), William Ruddiman hypothesized that man, through his agricultural practices beginning some 8,000 years ago actually did prevent an ice age, due to occur some 5,000 years ago from occurring. That, combined with the modern warming supposedly caused by industrialization has meant that the climate today, without man’s influence would be 1.5 – 2C cooler, meaning parts of northeastern Canada could be ice covered. This is also what Flannery proposed in his book The Weather Makers. It’s a Mann-tastic idea, of course, putting us today at the lower end of a scary-looking hockey stick. He does posit that once fossil fuels are depleted, some 200 years from now, that temperatures will decline once more. The only truth to the idea is that the warming we have experienced has been a boon to mankind, whereas cooling would have been deadly. I think we are approaching a tipping point, but it’s political and unrelated to the actual climate. Will the USA implement an ill-conceived cap-and-trade system to fund new social programs? Will we implement a less onerous and more transparent carbon tax instead? Will people press our political leaders to do nothing that will drag the economy further? Will the skeptics and realists finally be heard, or will they continue to be dismissed as flatearthers? That’s the real tipping point we’re approaching and it’s coming up fast. Pamela, maybe get some of that funding to the 5th grader you spoke of in another thread. Perhaps he will be able to forecast the weather here more accurately than has been done up to now. If it is so “easy”, than how come nobody can do it? I was surprised as it was the least intelligent and most mean spirited post I have ever seen from you. If you would be so kind as to explain why you felt it necessary to disrespect me in such a manner? Are you still upset that I dare to question Dr. Svalgaard? You have to admit there is little humility and much contempt for most of us in his posts, yet the fact remains that he might just be wrong. This possibility exists for all of us, pro or non, sun as driver or not. I have truly enjoyed reading your posts as they are well grounded and well thought out. Until that one. Were you having a bad day? WUWT? Seems that key Labour supporters in Australia who will be hit hardest by an Emissions Trading Scheme don’t like the idea. Paraphrasing: I have no idea what’s going on but it’s so scary! “Tipping Point” is the modern name for the God of Thunder. From a simple perusal of the polar ice-cores, the only “tipping points”, temp-wise, from an interglacial like today is down. And that from a glacial-max (like 20k yrs ago) is up. The reason, IMO, is snow/ice albedo-feedback. Once glaciers are vastly reduced like today, any further glacial melting has little effect since they’re at high latitudes and resulting small solar insolation. At the end of interglacials, cooling eventually produces enough permanent snow/ice far enough into lower latitudes that reflected sunlight/positive feedback causes a “tipping point” toward enhanced cooling. Notice that during mid-glacial periods temps swing wildly compared to today. This is because of the presence of reflecting ice at lower latitudes providing that positive feedback — it melts & gets warmer, it grows & it gets colder. Glacial maximums like 20k yrs ago are a bit harder to fathom — why doesn’t the glacial advance continue unabated? My guess is that further ice formation toward the equator is halted by poleward moving tropical ocean-currents, lack of glacier-prone land-areas, etc. Then there is the recovery from glacial maximums (which are very fast geologically). This is even harder to fathom. 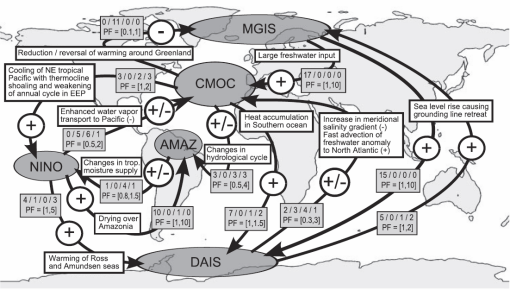 Perhaps some long-term negative-feedback operating in ocean currents? I don’t know. One thing that’s apparent is that some “trigger” seems to operate, like maximum summer sun in the northern hemisphere 15k-12k yrs ago that produced warmer temps there & pushed a tipping point toward rapid glacial melting. On that same web page, further down, there is are a couple maps of “coral bleaching hotspots”. Is it my imagination, or are the hotspots only showing up in places where no one ever goes? There is a tipping pointfor your patience too, I guess. You as americans, living in the most important country, are at the focus of this warming, cooling, or whatever climate conspiracy, and you are the first ones to be burnt under the magnifying glass of some unknown NGO composed of allucinated people which sword themselves as the ones being the sheperds of the human flock and who seek to apply on you what they are sure is for your benefit and well being. Pierre, that is precisely why I posted what I did. I understand the satire myself, but after reading some other posts it became apparent that some others perhaps did not. 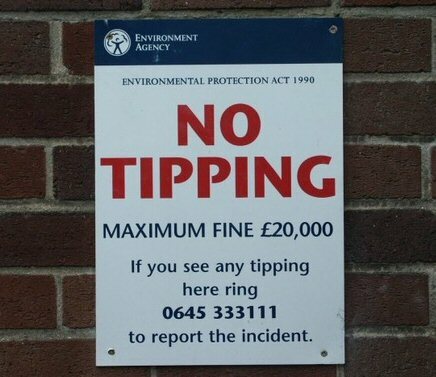 I think what is a bit misleading (and it grabbed me initially) is the caption to the image “Thanks to the Environmental Protection Act – tipping is illegal in the UK”. At least here in the US, the first thing one is opt to think of, is tipping your waiter/waitress in a restaurant or bar. And, I usually don’t think very highly of the EPA in our country, however, this particular law in the UK makes a lot of sense to me. It should be illegal to dump trash wherever you want, as it is here in the US, although you probably can’t tell in most places. The operational words in this Anna, are “IF ALL” ; and if it did that would be simply “off all”, wouldn’t it. Fortunately that doesn’t happen. The sun may be illuminating the moon (and earth) with a nearly colimated beam having about a half degree divergence; but in addition to a less than one reflection coefficient; the moon’s surface is a highly diffuse reflector, so one can reasonably presume that the moon is a Lambertian reflector. I think your back of envelope may have some typos, because if the moon is only 1/8th of earth’s diameter (that sounds too small) the areas would be 1/64th, which doesn’t get you any 5%. But if that was a good ratio, then the earth would subtend about 4 degrees. Google says moon is 1/4 earth; 3475 km versus 12742 km. So areas are 1/16, which would be 6 1/4%. But now earth subtends 2 degrees at moon or 1 degree semi-cone angle. So even a perfectly reflecting moon would only add 0.03% to earth’s solar energy, at full moon. Actually it is more likely that the moon’s surface reflectance is closer to isotropic than Lambertian, in which case it would be even less. I have no earthly idea where that > n < came from after the sin^2 term, so if Anthony or ops can’t expunge that; I’ll just claim that it needs to be there as the refractive index of space, which is 1, so just forget that n ; and in any case if it was the refractive index, it would have to be in there as n^2, so pray for rain to wash that n away. “”” But as to the earth’s climate having tipping points; given that the orbital parameters stay pretty much what they now are. No system that is as stable as the earth’s climate is, could possibly have tipping points, or it would have tipped a long time ago. Say E.M. IANAL but I tend to write like one. Now I deliberately put that in there for the express purpose of eliminating your ice ages hysteresis, which most people seem to agree happen when the orbital parameters change to something different from what we have now. Yes I agree that ice ages occur and are sort of regenerative; so I eliminated that case. OK; you have to read what I say; not what you thought I said. And yes Kiwiland still frowns on tipping and for the same reasons. Mike Bryant, excellent post. I’m for the second line , also. There are 3 types of people in the world, those that are good at math, and those that aren’t. I’m intrigued by the electric Sun hypothesis. 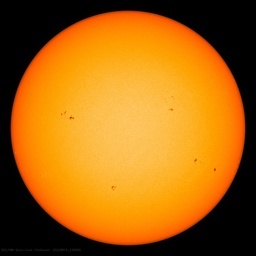 Apparently, the toroidal ring current surrounding the sun has disappeared or is experiencing less current density and has de-energized below our ability to detect. This makes sense if there is a drop in the current which is directed into the sun via the toroidal ring current. So basically the Sun acts like a condensor and the Earth acts as a ‘leaky’ capacitor (the components being the ionosphere, atmospheric moisture and the ground/crust) with the magma acting as a resistor. The magma is actually a dense, pressurized plasma, so the ‘drift’ current induces heating due to random electron collissions. The current also induces a magnetic field and rotation due to a homo-polar motor effect. The mass of the Earth acts like a flywheel, moderating any changes in rotational velocity due to fluctuations in the current. If this hypothesis is actually true, then climate extremes would be limited to the amount of current received from the Sun. It would also be more likely to reach the maximum limit more frequently than the minimum limit. The only ‘tipping’ point would be a sudden surge in the current powering the Sun. Then we’d have devastating CME’s to worry about (exploding plasma ‘double layers’, more so than any changes to climate. Anyway, I like to think outside the ‘sphere’. And besides, climate in that model is inherently controlled by total energy received from the Sun, like a heating element. I could be wrong, but empirical data, especially certain details, matches the model, imo. Anyway, I like to think outside the ’sphere’. I think you are far, far outside. The electric Sun hypothesis is not even wrong, but does have a certain entertainment value. You need to call George Noory of Coast to Coast AM; he’d love to talk to you about your hypothesis. He needs a change from Michio Kaku and some of his other regulars. George note I was saying radius not diameter for 1/8th, but I did forget that in these units the earth area would be 3.14, so instead of 5% it is 1.6% of the energy falling on earth. I am willing to forget that n. You are treating the moon as a diffuse source, I am thinking of it as a total reflector ( if aluminized) that would just keep the parallelism of rays coming from the sun, we should see an image of the sun. I am trying to think whether the cone is relevant in this case. It would not be for coherent radiation, and parallel rays seem similar to coherent to me, but you may be right. If so, one could put large parabolic mirrors to transfer the energy , but that would be much more expensive. If real those yellows and oranges are more probably related to undersea hot spots along the Nazca tectonic plate. They are simply showing areas where the temps are high enough to promote coral bleaching. 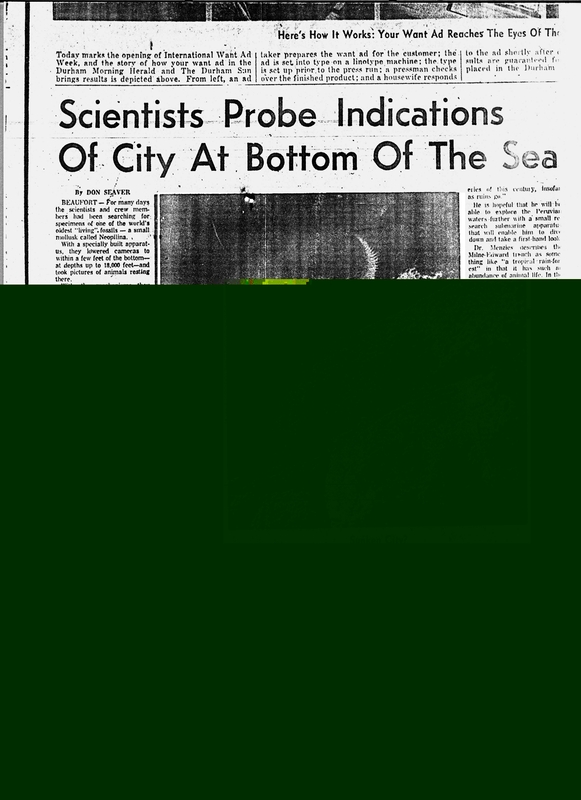 It is the exact same information as the SST graphic, but the color scale is shifted. Obviously the huge warm areas of the open, deep Pacific are probably not seeing much coral bleaching either. The graph has nothing to do with whether or not coral bleaching is being observed in any particular location. Thanks for your appreciation, ian. I would be flattered if others were to borrow my bon mot and extend its reach. I understand Icelanders do something similar too. But there is an issue, Geothermal sources do change. From memory, there are Geothermal installations in Iceland that are abandoned (Or were). Indeed it was. But the reduction in this use lead to another “problem” as I recall. Hot springs and mud pools were popping up all over town in Rotorua (Refered to Rotovegas on some Wellington radio shows), in fact some people were hurt or killed. Rotorua has the very famous “Champagne Lake”, spectaular, complete with CO2 bubbling up from the depths. Then there is Taupo with it’s hot springs too. Truely awsome place. David Ball, I am not sure which post you are referring to that I was mean spirited in. Regarding climate, I have posted my opinion about climate many times on this blog. Think back to your 5th grade science textbook: Temperate Forest, Desert, etc. These are all explained and their climates outlined. Unless the address changes for these ecosystems, the typical climate for each will pretty much stay the same within a range of weather pattern variations. Climate is easy to predict, weather, not so much. My above comment on “tipping point” is that it is likely used in order to get a submission to rise to the top of grant applications, or get an article published. My parody was related to that phrase. Carved columns in a “sunken city” of the Chavin culture , 6.000 feet under sea water. I think perhaps you’ve got it… The liquid water, vapor, ice limits. I’d only add that we are almost at the CO2 ice formation temperature at the south pole now. I have to imagine that at some point in the formation of an ice age it would be colder and we might well be sucking out CO2 along with water. If the plants had a CO2 starvation die back we’d be set for a reversal (and then perhaps the clathrates in the ocean bottom depressurize and start to bubble) we could get the “kicker” that started back toward the ice melt (more CO2, more water vapor, etc. ) phase. Basically I think that vegetation may well play a part and that part may interact with volcanic gasses and clathrate sequestration in the ocean bottoms. I wish I could recall the source but during the time period that the “snow blitz” theory was popular, some scientist built a model where the earth was covered with a single vegetation type that had white flowers and dark flowers when it bloomed. By changing the proportion of the two varieties, their impact on his albedo numbers were sufficient according to him, to trigger or terminate ice ages. For example if the dark flower variety liked cold weather, it would dominate when ice cover was maximum, (like pine forest) and if the white flower variety liked warm weather it would dominate during interglacial periods and push us back toward a cooler climate. I think the biggest problem is everyone is looking for “THE smoking gun”. I suspect we have lots of smoking “cap guns” that when combined are enough to do the job. What if we have 10 effects that tend to limit warming at some max temp and 10 effects that limit cooling at max ice cover, and each are about of equal impact? In that case, no one of them contributes more than 10% of the total necessary negative feedback to put a hard limit on either excursion. You don’t necessarily need to find the driver, you may in fact be looking for a team of drivers each of which is insignificant by themselves. One other thought on this topic, came to me as well last night. In my view, the weakest side of my theory is the cold recovery to warming trigger limiting factors. I got to thinking last night, that at max ice coverage, we also have lots and lots of continental shelf that is exposed and it has 100,000 years to be covered by mature dense forests and grass lands that tolerate cold climates. In solar energy research studies, they found that there was hardly any practical difference between the thermal efficiency of a solar collector painted dark green vs one painted flat black. Dark green is a very acceptable color to absorb solar energy. The cold limit could be a combination of new exposed land area due to dropping sea levels, which during the summer time gets quite warm without near by bodies of water to moderate the temperature. High dust levels (already demonstrated during cold periods) to “dirty” the ice in the summer. The remaining low humidities implied by the high dust content, make convective thunderstorms almost impossible due to both low humidity and over seeding air masses (think dust bowl). That drastically cuts albedo reductions due to thunder storm and hurricane cloud decks, and the heat transfer due to convective pumping of heat into the upper troposphere through that mechanism. Add one or two other minor effects and you might have sufficient negative feed back to turn it around after 100K years. Side note — one of the most efficient thermal conductors known to science is the heat pipe. A heat pipe is a tube containing a fluid which can evaporate, held at low pressure so the fluid is near its boiling point. When the hot end of the heat pipe is exposed to heat, the fluid flash boils and rushes to the cold end of the heat pipe where it condenses out, giving up its latent heat as it changes back to a liquid. It then is transported back to the cold end of the tube by capillary action in the wick lining the inside of the tube. A convective thunderstorm is, for all intents and purposes, a gigantic heat pipe. It takes heat captured and stored in low level water vapor, which when atmospheric instability reaches a critical value it “turns on” and explodes into rapid heat driven convection, pushing millions of tons of water vapor to high altitude where it freezes out as ice crystals over a very short time period, releasing its stored latent heat to the upper layer of the troposphere. Strong storms even push up past the troposphere into the lower levels of the stratosphere in over shooting tops, where that heat can easily be radiated to space at altitudes of 60,000+ft. Then that water is recycled back to the ground as rain, snow, or hail, (like the wick return path in the heat pipe) to be reused the next day to store and move heat again. If you think of the total latent heat of water liberated at high altitude, from a storm that is capable of dropping 2 inches to 20 inches of water content over a hundred square miles in a single evening. The combined heat pumping potential of the worlds thunder storms is mind boggling. All you need to verify that is the cool SST path that follows a large hurricane as it cools the ocean surface by both shading and pumping heat to the upper atmosphere. SST drops from a single storm can be on the order of 4 deg C, over its storm track. Interesting idea. I think it would be more effective to keep the aluminum as sheets in near geosync orbit so you could get more direct reflection onto the planet… much less mass to lift. Then again, maybe all we would need to do is swap all the cows, pigs and chickens from corn meal to beans ;-‘) Gee, this is much more fun than all that AGW doom and gloom! Yes….a TEAM of DRIVERS. Very insightful explanation and observation. Enjoyed your post. tallbloke (00:31:26) : I think there is the danger of falling into the same mindset as the warmista here. Didn’t I read somewhere that a single hurricane develops as much power as the entire U.S. annual consumption of energy? Or something along those lines. If we entertain ideas of being able to tweak the thermostat, it gives creedence to a false notion of potential human influence. Similarly there is a world of difference between an accidental deposit of a trace of soot and the deliberate engineered creation of kilotons of it all deposited in exactly the most effective places. Heck, I just thought of another one that might work! There is an area of below sea level in Egypt. A tunnel to the sea makes a giant salt evaporator. Ship that salt to the N. Pole and you get a “2 fer” with enhanced ice melt AND extra salinity accelerating the thermohaline circulation. There are, after all, a few orders of magnitude difference between “ice gone in 5 years” and “ice slowed a small percent each year for 10,000 years”. George E. Smith (09:15:00) : See where I said; “given that the orbital parameters stay pretty much what they now are. ” OK; you have to read what I say; not what you thought I said. Sorry. I took that to mean “Given that the orbital variations in ellipticity , inclination et.al. and polar obliquity precession et.al. stay pretty much varying as they do now” rather than as you have clarified “If we froze the earth orbital ellipticity, inclination et.al. and the polar obliquity, precession et.al. at present values”. My mistake. I presumed you would not be postulating the impossible, when in fact you were postulating a hypothetical world. Reply: Duuude ~ charles the moderator. No No.. Tipping point = The point at which no one believes your theory anymore. Hehe.. I give it 5 years before the screaming becomes Ice age! Ice age! The only tipping point I have seen is a change from warm to cool but the beauty of it all is… just about the time it gets on a roll.. the climate will change again .. hahahah! E.M. Smith and Anna V.
Wanted you to know that my “mental ears” perk up when I encounter a comment from either of you and have enjoyed following your exchanges concerning the oncoming ice glacial period. 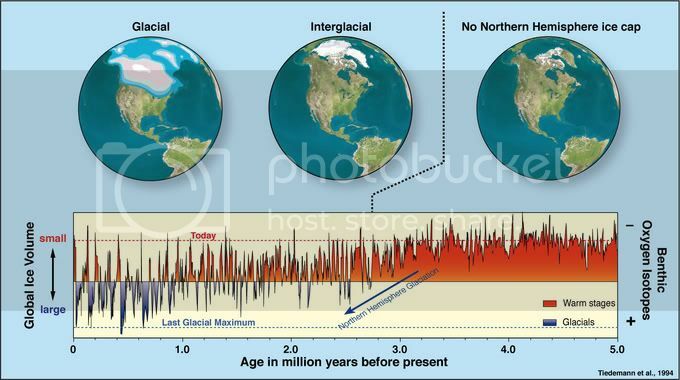 I gather that recent paleoclimatology findings suggest that the onset of a glacial period can behin within as short a period as a few decades, as opposed to the hundreds or thousands of years previously thought. My recemt reading suggests that there is no useful way for estimating when the next glaciation will begin since there a recent study has found ony about a 20% agreement between the earth’s orientation to the sun and the start of glaciation. I think that the longest interglacial (four periods back) was about 20,000, but most are in the range of 10,000 to 15,000 years. And it appears that the glacial periods have been getting longer, but the interglacoa; periods have not, which is kind of interesting. Despite the clever ideas that the two of you have come up with, my own notion is to keep an ear cocked for unusual weather events that migh possibly be related to the coming glaciation. Such as the recent Siberia-like cold in parts of Canada and the northern US, and the third of a mile advance of the Alaska glaziers in Glazier Bay — the first advance in 250 years. And finally, I want to extend a point E.M Smith made in an earlier post and which has a direct bearing on the topic. 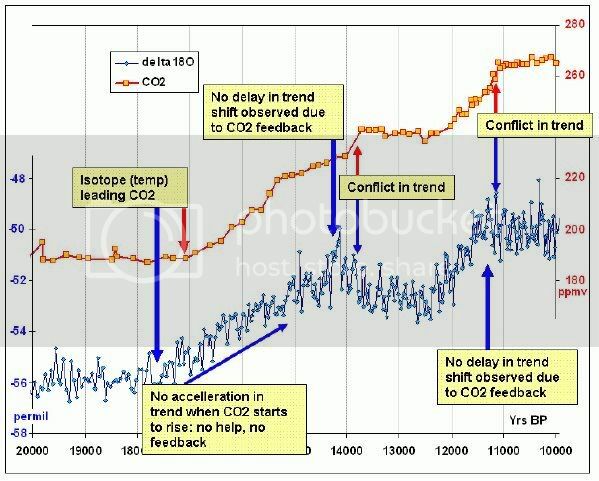 There really is a real and important “tipping point” relative to change in the level of CO2. If it drops below the range of 150 to 200 ppm C3 plants will begin to suffer from carbon starvation.This is not a speculative issue, since evidence for this occuring during the last glacial period has been retreived from tree specimens retreived from the La Brea Tar Pits. Paleoclimatologists have also speculated that low levels of CO2 occuring during glacial periods might have been responsible for the transformation of forrests to savanas that were critical to human evolution. Please don’t request links, since I do not have the means for providing them. I am 83 and do not have the know-how for keeping track of the articles that I read in Googling. Pamela, your need to put me down to feel better about yourself does not look good on you. Neither climate nor weather can be predicted using 5th grade science books. Or 12th grade science books. This is what makes the phrase “Climate Change” so ridiculous. Your generalizations are also unbecoming. Calgary’s weather is chaotic in the extreme (as other posters have mentioned), and it seems it has become even more difficult to forecast of late. I was doing UHI studies with my father 36 years ago (about grade 5, coincidentally), so I do not appreciate your condescension, thank you. Perhaps you thought my question was simplistic, but I think it is you who missed the point. My father has a Doctor of Science in climatology, I do not, but it is possible that I may have picked up a little more than 5th grade science growing up. Matthew Heberger, Heather Cooley, Pablo Herrera, Peter H. Gleick, and Eli Moore of the Pacific InstituteAQMD. Quoting from the Abstract: ” Over the past century, sea level has risen nearly eight inches along the California coast, and general circulation model scenarios suggest very substantial increases in sea level as a significant impact of climate change over the coming century. This study includes a detailed analysis of the current population, infrastructure, and property at risk from projected sea‐level rise if no actions are taken to protect the coast. The sea‐level rise scenario was developed by the State of California from medium to high greenhouse gas emissions scenarios from the Intergovernmental Panel on Climate Change (IPCC) but does not reflect the worst‐case sea‐level rise that could occur. We also evaluate the cost of building structural measures to reduce that risk. If development continues in the areas at risk, all of these estimates will rise. No matter what policies are implemented in the future, sea‐level rise will inevitably change the character of the California coast. Earthquakes here tend to move sideways, not up and down so much. We have many more problems from ground subsidence due to oil and gas extraction, and some from water wells. see these two links, both for Long Beach, California. I notice your comment about Pamela and took the trouble to go all through this thread, as being mean spirited would be very uncharacteristic of the posts I have seen from her. All I can see is a parody she made and a mild comment. Unless something has been deleted I honestly can’t see anything that would upset you so much. I think it was just a misunderstanding. TonyB: After checking back to Pam’s remark, I agree with your comment to David. You have to go to the thread regarding Al Gore’s Writing on the wall. There is no misunderstanding. I do not care if I am popular on this blog, it seems I am not, but If you read back further I will be vindicated. I had a legitimate question, which Anthony did not answer in his response, by the way.You must admit that to imply that a 5th grader can predict weather is an unintelligent remark and was clearly meant to mock. For what reason she would decide to mock me is beyond my knowledge, and you will read in that thread my question as to why she felt the need to do this. I do not attack anyone on this sight, I do not engage in ad homs. I guess I do not fit into her little “community” on this blog. I thought we were on the same side. A house divided cannot stand said the man in the stove-pipe hat.